One aspect of my job that I enjoy most is traveling to fire service events and having the opportunity to address audiences who are interested in learning about the work being performed by CFSI and the other national organizations on Capitol Hill. It doesn’t matter to me if I have two people in the audience or two hundred. I always look forward to sharing with them CFSI’s efforts to advocate for federal programs and legislation that address the needs and challenges of our one million firefighters and emergency services personnel. Registration is now open for the 30th Annual National Fire and Emergency Services Symposium and Dinner, hosted by the Congressional Fire Services Institute (CFSI) on April 18-19, 2018 in Washington, DC. Attended by approximately 1,500 fire and emergency services leaders from across the country, the event is the largest and most prestigious gathering of fire service officials, featuring important seminars and opportunities for interaction with federal policy makers. Now you can make a positive difference for CFSI by becoming a sponsor of the National Fire and Emergency Services Symposium and Dinner. Each year, we offer a number of sponsorship opportunities. Ranging in values, they offer a number of unique benefits that will capture the attention of our 1,500 guests. Take a look at the complete list of sponsorship opportunities we are now offering for our 2018 program and let us know which appeals to you. If you have questions, do not hesitate to give us a call at 202-371-1277. The Congressional Fire Services Institute (CFSI) is now accepting nominations for the CFSI/Motorola Solutions Mason Lankford Fire Service Leadership Award and the CFSI/NFFF Senator Paul S. Sarbanes Fire Service Safety Leadership Award. The deadline for submissions is December 7, 2017. With the support of many vendors, CFSI will host a Silent Auction at Firehouse Expo that will feature an array of exciting gifts. The auction will begin on the morning of Thursday, October 19th and conclude at 12:30 pm on Saturday, October 21st. Unlike traditional silent auctions, this event will display the items at the vendors’ booths. This way, trade show attendees can learn about the innovative equipment, services and technologies that our supporters are providing to our nation’s firefighters and emergency services personnel. CFSI will begin accepting nominations for the CFSI/Motorola Solutions Mason Lankford Fire Service Leadership Award and the CFSI/NFFF Senator Paul S. Sarbanes Fire Service Safety Leadership Award on October 23rd. The deadlines for submitting nominations for both awards will December 8th, 2017. We offer our thoughts and prayers to the Amabili family on the death of such an extraordinary man in Louis J. Amabili. When you perform a duty for over 70 years, it’s out of passion and dedication to a meaningful cause. For Lou, the cause was the health and safety of our firefighters. While Lou will be missed, his contributions and legacy will remain forever embedded in the pages of our most impactful document – AMERICA BURNING – and in the counsel he offered to so many of us throughout the years. Louis J. Amabili, a member of the CFSI Board of Directors since 1994, passed away earlier today following an illness. A member of the Delaware fire service since 1947, Lou gained national recognition in the fire service when President Richard Nixon appointed him to serve on the National Commission for Fire Prevention and Control in 1970, which produced the landmark report, AMERICA BURNING. 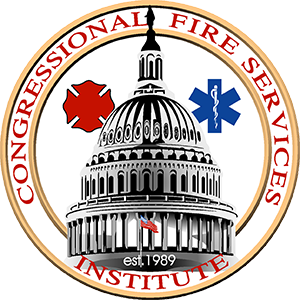 The Congressional Fire Services Institute (CFSI) is announcing an official Call for Proposals for the 2018 National Fire and Emergency Services Symposium. The Symposium will be held in Washington, DC on Wednesday, April 18, 2018, in conjunction with the 30th Annual National Fire and Emergency Services Dinner. Seminars should focus on federal policy or issues that are national in scope, and have a positive impact on the nation’s fire and emergency services. Seminars intended solely to promote for-profit programs and activities that specifically benefit an organization will not be considered. Seminars are limited to 50 minutes in length. Where applicable, proposed panelists and moderators should represent a diversity of national organizations and fire service disciplines. Proposals must be submitted to CFSI no later than October 6, 2017. Proposals can be submitted here. A primary point of contact for the submission, including name, phone number, and email address. All proposals will be reviewed by CFSI’s staff and the Programmatic Subcommittee of CFSI’s National Advisory Committee. Incomplete proposals will not be considered. Applicants must agree to work with CFSI to finalize participants, produce relevant materials, and promote the seminars series. CFSI reserves the right to make changes to panelists and seminar content. Questions regarding the Call for Proposals should be directed to Sean Carroll, CFSI’s Director of Government Affairs, at [email protected] or (202) 371-1277.